These postage stamp images may look familiar. In 2013, I had designed these guys as little magnets. Unfortunately, because of the thick layer of Crackle Accents (Ranger) on each one, they curled up and did not look so pretty on the refrigerator. I removed the magnets, and adhered them to this card instead. They were the inspiration for all other design choices here. 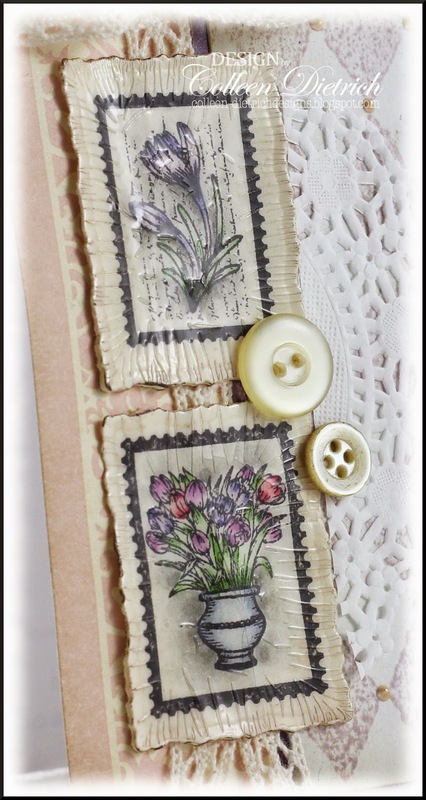 The pale pink damask paper is retired (of course) from Stampin' Up!, and the Harlequin Background / Inkadinkado was stamped with Milled Lavender. Yep, sure do hate to throw anything away! I always try first to repurpose before trashing. Well what a great idea.. Because your card looks beautiful. I LOVE the way those stamps look. Gorgeous! 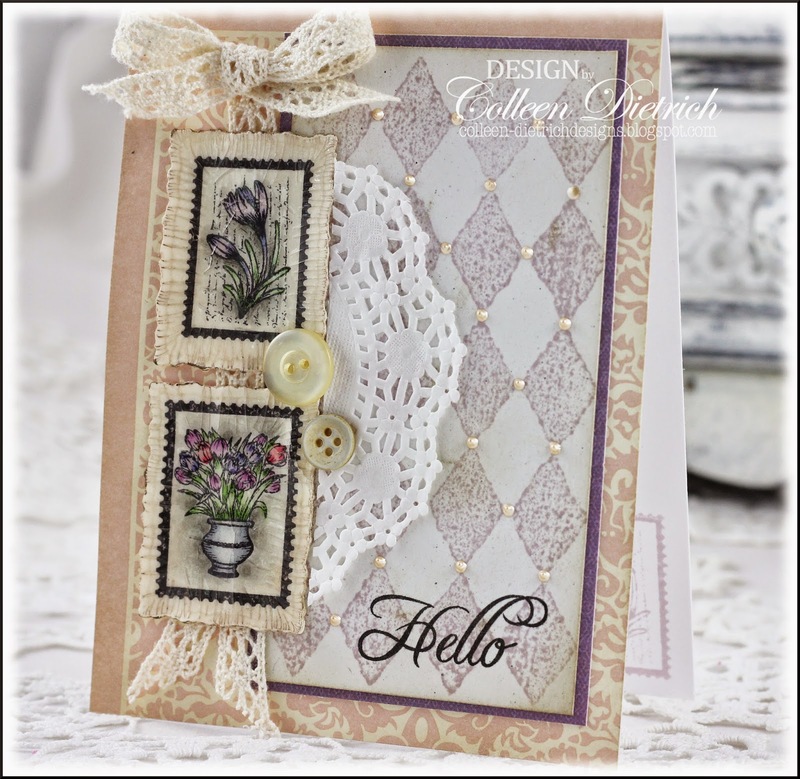 LOVING the postal stamps and the lace!!!!! Gorgeous! I ran right over to IBS's site to see these stamps....you know me, they're right up my alley! Beautiful background too! Are you snowed in???!!! Can't wait for spring! Colleen, I love the curled or furled look around the edges. I think it makes them look like vintage rectangular buttons and just perfect for this card. Lovely. Your stamps look beautiful on your card! Good for you for rescuing them! 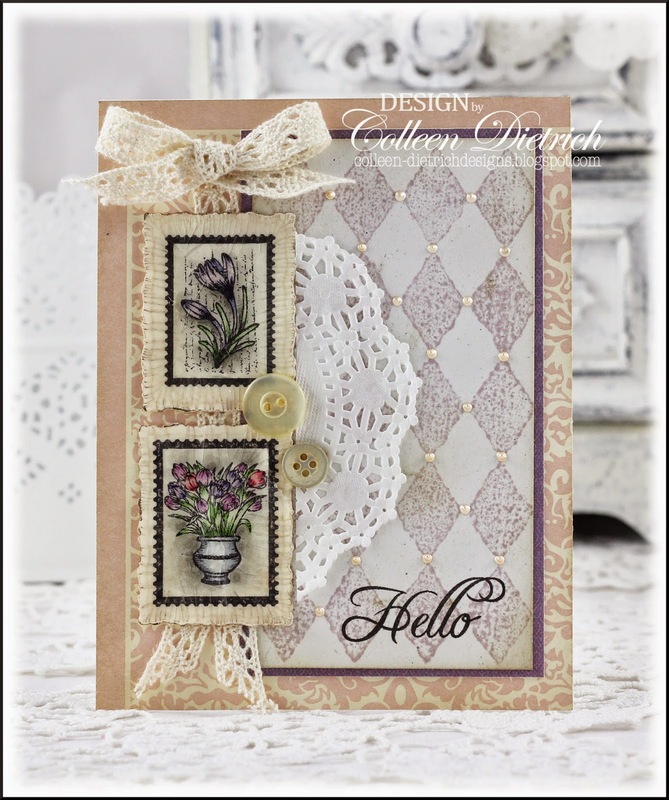 Those stamped images look wonderful on your pretty card! Good thing you didn't throw them away! Breathtaking, Colleen! I LOVE the pearls. The damask paper was one of my favorites...it was gorgeous! Well I don't know how they looked on your fridge, but they look gorgeous on your card!! Love all of your special Colleen touches. Did you get hammered with the latest snow? It went south of us, thank goodness!! Lovely card~ I miss that challenge! This is so beautifully vintage, Colleen! I'm so glad you found a new home for those images as they sure look amazing on your card! What a pretty card, Colleen. Love the vintage, feminine-soft feel to it.